Kohls.com is offering free shipping on any order today, no coupon needed. You can get an additional 20% off your order by using coupon code SMS295. 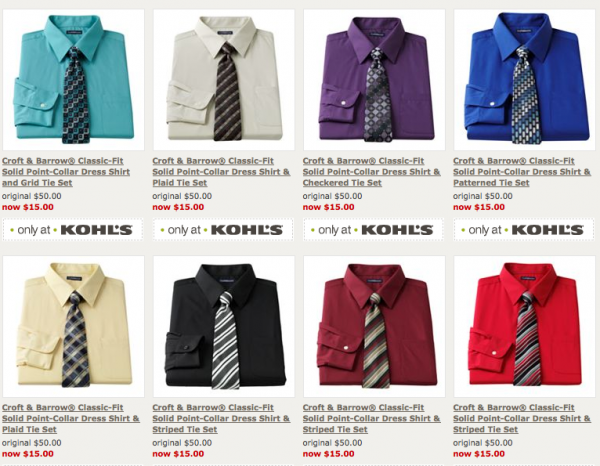 They have a number of different sizes and colors of Men’s Dress Shirts and Tie Sets clearanced to $15, making them just $12.72 shipped (plus any applicable tax) with coupon code SMS295. Fabulous deal for my shirt & tie wearing hubby! It always seems like his shirts all go out at once. 🙂 Thanks for passing it on! This is great–just got four (and a maternity top for me;))–My husband was needed new shirts. Does anyone know if you can order online using a gift card? May be a silly question, but I don’t do much online ordering. Didn’t think to reply to this…but, yes Jennifer, you can use a gift card. It’s on the same page as the credit card/promo code offer. Good luck! Thanks! I was just thinking, “Hmm, time to pick out some new dress shirts for my husband.” It’s so ridiculously easy to shop for him. Just find a shirt, pick the size, boom. Works. Congratulations on graduating! Seriously that is not an easy thing to do. Since we graduated from law school several years ago Kohl’s has been by far our favorite place to shop for my husbands work clothes. The last time they had a Kohl’s cash promo we were able to score a suit jacket, 2 matching suit pants, five dress shirts, a tie and a dress belt for a little over 100.00 and we got 20.00 back in Kohl’s cash which I was able to use to buy an outfit for my husbands brothers wedding for only 6.00 which was mostly tax. Got to love Kohl’s. AWESOME!!! I feel like I just hit the jackpot with that. Four shirt/ties for hubs, two shirts for me, a onesie for the beebee and didn’t even spend 90 bucks. And JENNIFER…it looks like, yes you can use a gift card. There’s a place for gift cards and promo codes once you’ve been through all the shopping. THANK YOU for this!!!!! The free shipping deal was only good through the end of yesterday, unfortunately. Oops, now I see that this was post is from yesterday, so the free shipping deal has probably passed me by.